Heathrow commissioned Creative Triangle to create the look and feel for their Retail Business Partner Conference which took place last week at the BAFTA headquarters. The overarching theme was ‘Transforming Performance through Service’. Our design concept, which incorporated all the elements of retail at Heathrow, was then applied to the invitation and exhibition panels throughout the conference. We’ve just finished working on the marketing materials for Birmingham Conservatoire’s Frontiers Festival of Contemporary Music. For the second year running we were asked to design a 20 page programme, A5 flyer and pull up banner. This year the theme was ‘decomposing music’ and the design included visuals of knock-downed buildings. A nod to the Adrian Boult Hall’s imminent demolition and the new state-of-the-art Conservatoire building that is under construction. We also supplied elements to be used by the client to create a consistent look and feel across their website and social media. 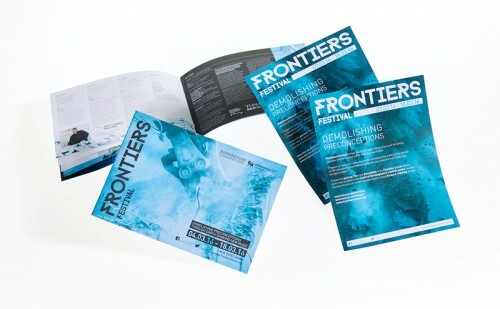 Follow the festival on twitter @frontiersplus or find them on facebook/frontiersplus.